Ez az oldal a teljesen új felhasználóknak próbál eligazítást adni a LinuxCNC program használatára. Valamint a G kód tuljadoságainak megismerésére. This is an almost never seen on the web, tutorials without any ads… I hate tutorials written or stolen solely for profit! Az alábbi linkek tartalamzzák az alapvető információkat a szoftver hivatalos oldaláról, ezek sajnos angol nyelven találhatók. Lehetőség szerint törekszünk minden leírás részletes fordítására a későbbiek folyamán. A következő felyezet, próbál a kezdőknek segítséget nyújtani beállítani és futtatni a g-kódokat. Bizonyos részek jelenleg fejlesztés alatt vannak. Első indításnál, illetve ha a terminálba begépeljük, hogy linuxcnc az indításhoz, a LinuxCNC a konfigurációs scriptel indul el. A konfigurátor végigvezet a hardver beállításokon. Ezt megfelelően beállítva, a program az automatikus indotási procedúrán keresztül indul el. INI file Ez a fájl betölti a konfigurációs beállításokat, ez tartalmazza a tengelyek, a tálca, a gép adatait, valamint a grafikus felület beállításait. Ezek után töltődik be a hal fájl HAL files Ebben a fájlban helyezkednek el a HAL komponens leírók. 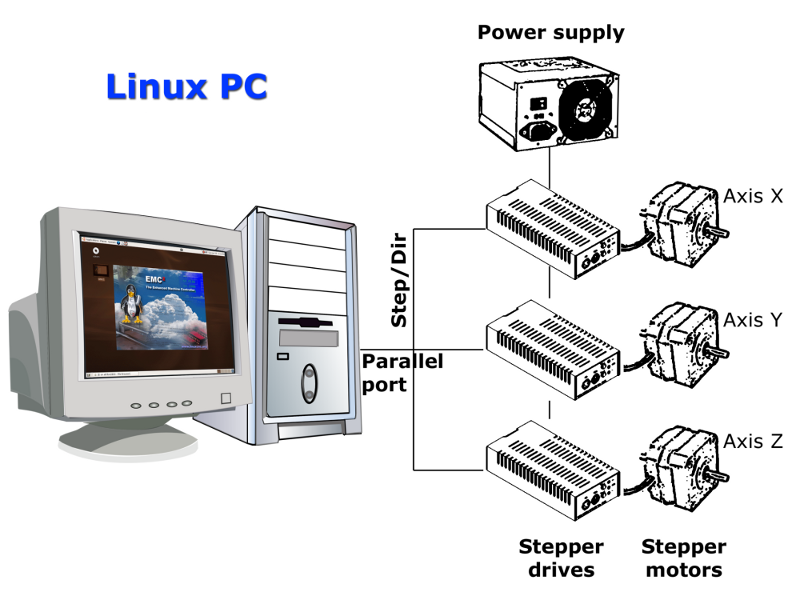 Amikor készítünk egy beállítást a Stepper Configuration Wizard-al vagy a Mesa Hardware Wizard-al vagy csak felveszünk egyet a Configuration Selector menü ből a LinuxCNC készít egy ugyan olyan nevű konfigurációs fájlt a config menüben.. A következő plda a fálszerkezetet muataja be:My Lathe. Lehetőség van másik könyvtárnevek létrehozására is a konfigurátorban. LinuxCNC képes vezérelni gépi szerszámokat, romotokat, egyéb CNC gépeket. Csatlakoztatható szervó motor, léptető motor, kimeneti relék, bemeneti eszközök, szenzorok. Valamint képes 9 tengelyig koordináta vezérlésre. A fenti ábra bemutatja egy szimpla gép felépítsét tipikusan 3 tengely által vezérelve. Ez az ábra léptetőmotoros vezérlést mutat be, mely elemei a PC, ez szükséges iprai kivitelben magas zavarvédelemmel ellátva duál, vagy atom processzoron, amihez kapcsolódnak a printer porton kersztül a léptetőmotor vezérlők, itt TTL szintű vezérlési jelek áramlanak, melyd a vezérlőkből továbbítódik a magas feszültségű vezérlő áram a motorokhoz. 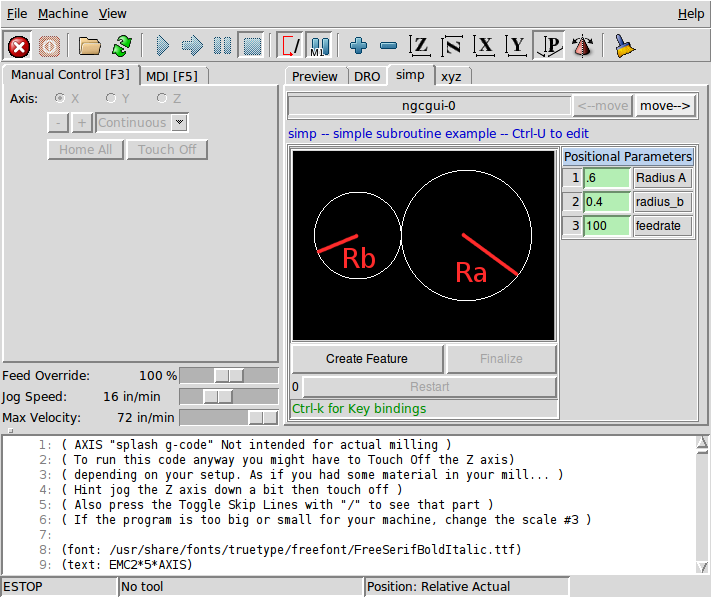 A LinuxCNC képes szervó motorok csatlakoztatására, megfelelő illesztő kártyák közbeiktatásával. .
NGCGUI, a subroutine GUI that provides fill in the blanks programming of G code. It also supports concatenation of subroutine files to enable you to build a complete G code file without programming. 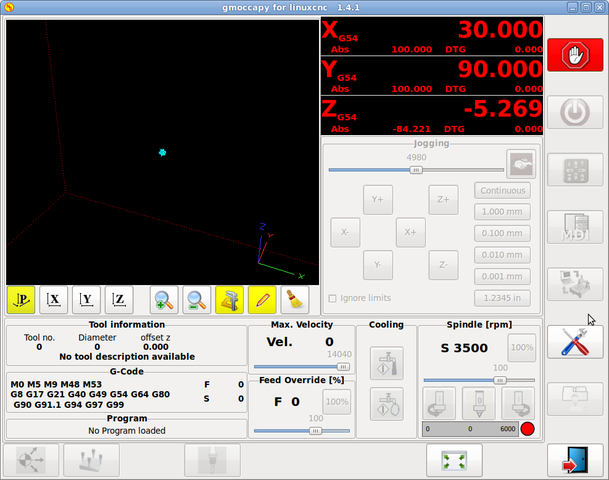 The following screen shot shows NGCGUI imbedded into Axis. Keystick, a character-based screen graphics program suitable for minimal installations (without the X server running). Xemc, an X-Windows program. A simulator configuration of Xemc can be ran from the configuration picker. 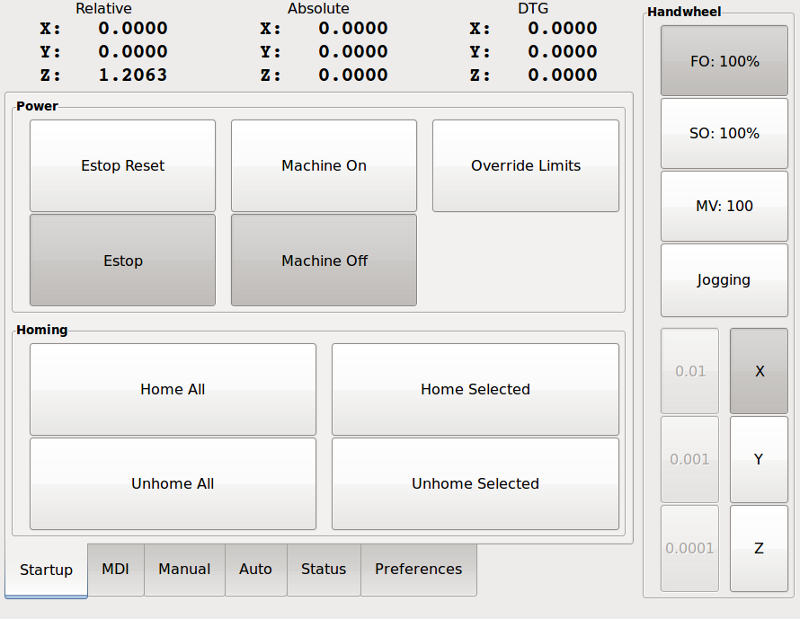 halui - a HAL based user interface which allows to control LinuxCNC using knobs and switches. See the HALUI chapter for more information. linuxcncrsh - a telnet based user interface which allows commands to be sent to LinuxCNC from remote computers. PyVCP a python based virtual control panel that can be added to the Axis GUI or be stand alone. 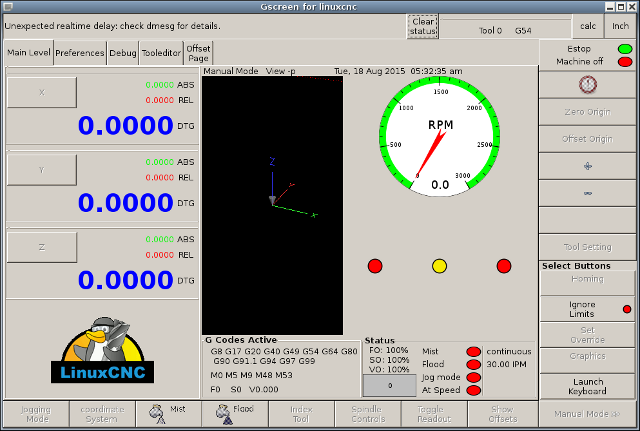 GladeVCP - a glade based virtual control panel that can be added to the Axis GUI or be stand alone. See the PyVCP chapter and theGladeVCP chapter for more information on Virtual Control Panels. 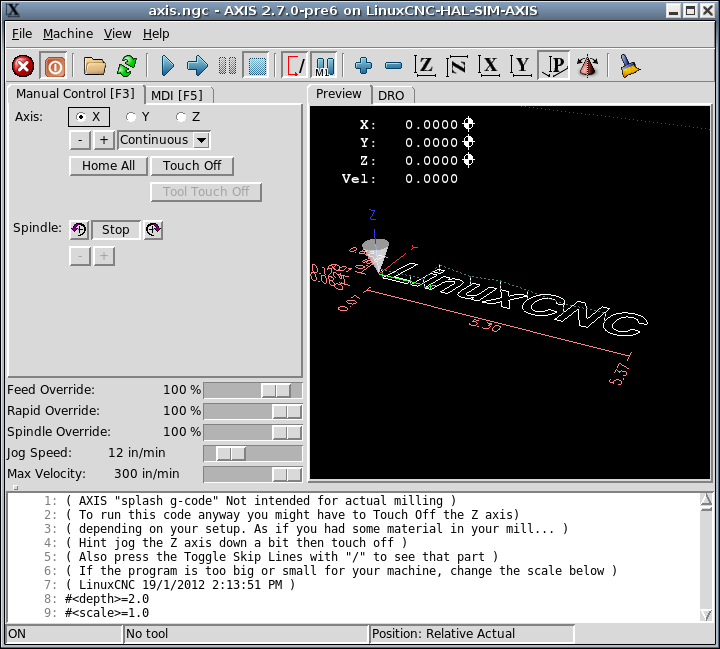 LinuxCNC uses translation files to translate LinuxCNC User Interfaces into many languages. You just need to log in with the language you intend to use and when you start up LinuxCNC it comes up in that language. If your language has not been translated contact a developer on the IRC or the mailing list if you can assist in the translation. This book will not even pretend that it can teach you to run a mill or a lathe. Becoming a machinist takes time and hard work. An author once said, "We learn from experience, if at all." Broken tools, gouged vices, and scars are the evidence of lessons taught. Good part finish, close tolerances, and careful work are the evidence of lessons learned. No machine, no computer program, can take the place of human experience. As you begin to work with the LinuxCNC program, you will need to place yourself in the position of operator. You need to think of yourself in the role of the one in charge of a machine. It is a machine that is either waiting for your command or executing the command that you have just given it. Throughout these pages we will give information that will help you become a good operator of the LinuxCNC system. You will need some information right up front here so that the following pages will make sense to you. When LinuxCNC is running, there are three different major modes used for inputting commands. These are Manual, Auto, and MDI. Changing from one mode to another makes a big difference in the way that the LinuxCNC control behaves. There are specific things that can be done in one mode that cannot be done in another. 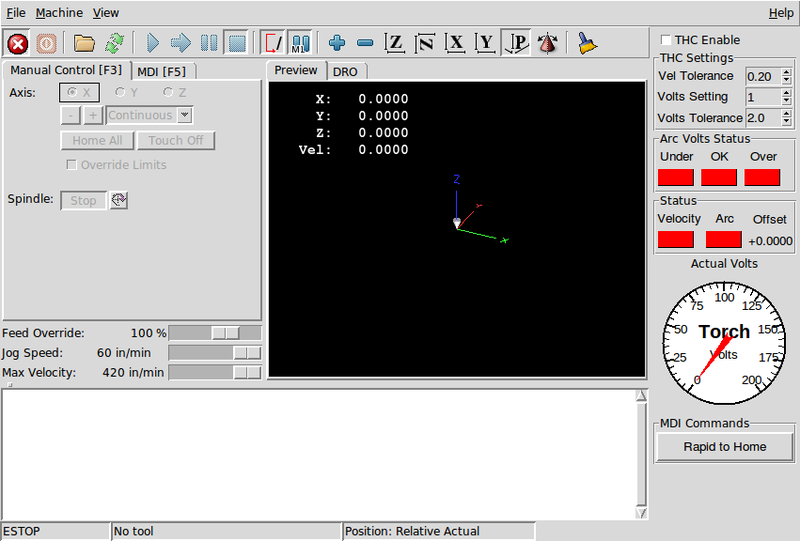 An operator can home an axis in manual mode but not in auto or MDI modes. An operator can cause the machine to execute a whole file full of G-codes in the auto mode but not in manual or MDI. In manual mode, each command is entered separately. In human terms a manual command might be turn on coolant or jog X at 25 inches per minute. These are roughly equivalent to flipping a switch or turning the hand wheel for an axis. These commands are normally handled on one of the graphical interfaces by pressing a button with the mouse or holding down a key on the keyboard. In auto mode, a similar button or key press might be used to load or start the running of a whole program of G-code that is stored in a file. In the MDI mode the operator might type in a block of code and tell the machine to execute it by pressing the <return> or <enter> key on the keyboard. Some motion control commands are available and will cause the same changes in motion in all modes. These include abort, estop, and feed rate override. Commands like these should be self explanatory. 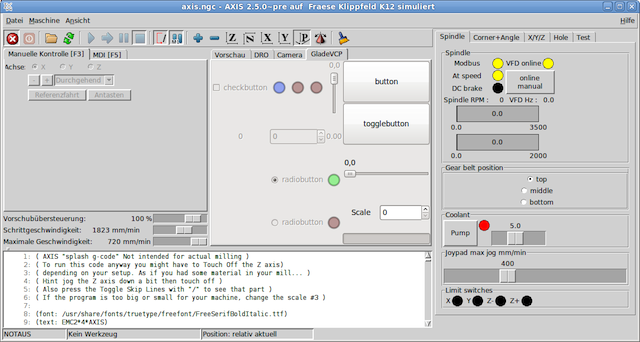 The AXIS user interface hides some of the distinctions between Auto and the other modes by making Auto-commands available at most times. It also blurs the distinction between Manual and MDI because some Manual commands like Touch Off are actually implemented by sending MDI commands. It does this by automatically changing to the mode that is needed for the action the user has requested.